●Wide operating temperature range Laser-sealing type: -40℃ to 85℃ Crimp-sealing type: -40℃ to 60℃ Thin film battery: -20℃ to 60℃ Depends on battery type,output current and environmentcondition. ● Low self-discharge rate Less than 1% per year at room temperature. ● Extremely safe UL(MH45237/MH49306),UN38.3,CE and RoHS certificated. 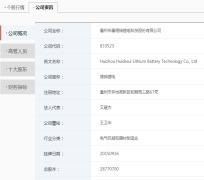 The company was listed in NEEQ on September 16, 2015, stock code: 833523.